Création 2018 Momix, international festival for young audiences. From February 27h to March 3nd 2018 – MA, Scène nationale – Pays de Montbéliard. A creation for young audiences, first in its genre for Héla Fattoumi and Eric Lamoureux who will be exploring the imaginary world in a museum, including fantastical presences and danced dreams. Alone in a deserted museum gallery, a guard is beginning to nod off. 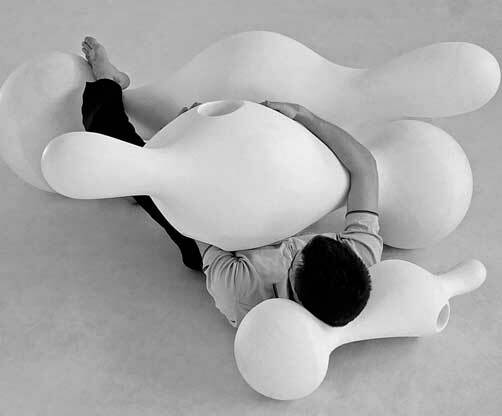 Surrounded by four large, organically shaped sculptures, he drifts into a strange hallucination, a wonderful dream during which he becomes one of these intriguing statues. These creatures, half-human, half- vegetable, are called OSCYLS. They are part of a family of fantastic characters, ranging in size from quite small to very large, resembling mysterious marine beings or perhaps a cloud formation, fallen from the sky and solidified. Children learn very early that in museums it is forbidden to touch the works of art. But in this wonderful dream world, the rules don’t exist. And it is the guard who first dares to touch the smooth surfaces of these fascinating statues. From there, things progress. The guard’s hand acts like a magic wand: at his touch the statues awaken, come to life and begin to move. From his first contact to a caress, followed by a gentle but voluntary push, it takes a single step. 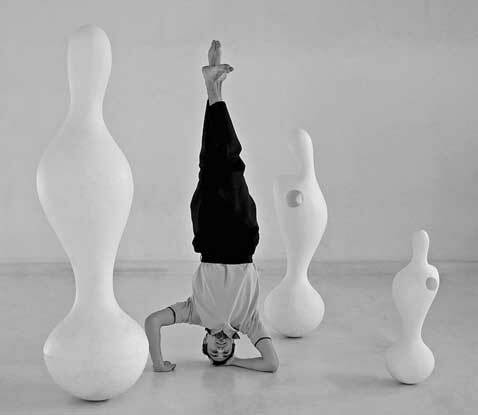 Having been turned on, released, the sculptures tilt, whirl, bend over and begin dancing, in duos and body-to-body work. Thrilled by their release, they choose their own rhythms and their own movements, seeming to be completely in control. Taken aback by the sculptures’ unexpected reactions, the guard wonders who exactly the OSCYLS are – when they begin moving they take on a number of surprising identities. Are they women, men, a dancer’s body oddly extended ? Friends, alter egos, playmates, adversaries, puppets, stuffed animals or a cuddly toy to whom one might whisper, or supernatural beings ? Welcome to this museum unlike any other, transformed with projected 3-D videos into a dream-like space in which things come to life and take flight.